Why make holes in your leak-proof roof? 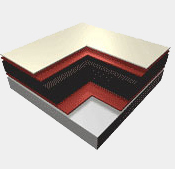 ELASTOTITE G 20140 polyurethane insulating adhesive makes leaks caused by nails and screws a thing of the past. Spray-applied and seamless, with tenacious adhesion to almost any surface – even in a wind storm.